As part of our ongoing commitment to the future of learning and assessment, BTL Surpass regularly hosts, sponsors and attends seminars and events. Furthermore, our clients often demonstrate how they use our products and services to deliver and enhance their own assessment programs. the manner in which e-Assessment as a process is changing and growing and advancing. Join Ashleigh and Georgina from the Surpass training team as they introduce and demonstrate upcoming features for creating better exams in the most efficient way possible. In true Surpass Community style, we invite you to ask questions and share your thoughts via the live chat function located next to the video window. Join Tim Burnett and representatives from AlphaPlus Consultancy as we take a look at the positive impact Computer Adaptive Testing is bringing to a national formative assessment programme. As this is an interactive Surpass Community Webinar you can ask the team a question using the box to the right of the video player. The Certification Network Group (CNG) quarterly meetings in Chicago are an excellent opportunity for individuals and organizations who are interested in certification to learn, network and share best practice. The simplification of the interaction between SME and Test Publisher. How can this become a friction-free experience? Can case study and reference materials enhance the value of assessments? What data can enhance test item development and review processes? Join us in May for this specially extended CNG Meeting in Chicago, 9am until 1.30pm. The Certification Network Group (CNG) host several regular events throughout the year, with each focusing on a different theme. Please visit their website for details on specific events as they are announced. Mark it in your calendar, and prepare for what is sure to be the biggest gathering yet of assessment professionals in the Surpass Community, coming together to share, learn, innovate and discover across a range of seminars, workshops and relaxed evening entertainment. Join Holly and Tim as we walk you through some of the latest features available to the Surpass Community in the Surpass Winter 2019 release. To join our live stream, simply go to https://www.btl.com/surpasslive, enter your name and email and the video should automatically start playing when we’re ready to begin. You can ask the team a question using the box to the right of the video player. 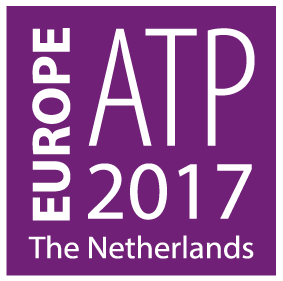 ATP Innovations in Testing have announced a provisional date and location for their 2019 conference. Join Tim and representatives from BTL’s Test Delivery Services team as we take a look at different delivery options to help you grow your candidate offer. We’ll be looking at test centre based delivery across the globe and sharing experiences from members of the Surpass Community. We’ll also be discussing our new Online Invigilation service and how dual camera technology can help increase test security and prevent cheating and item harvesting. 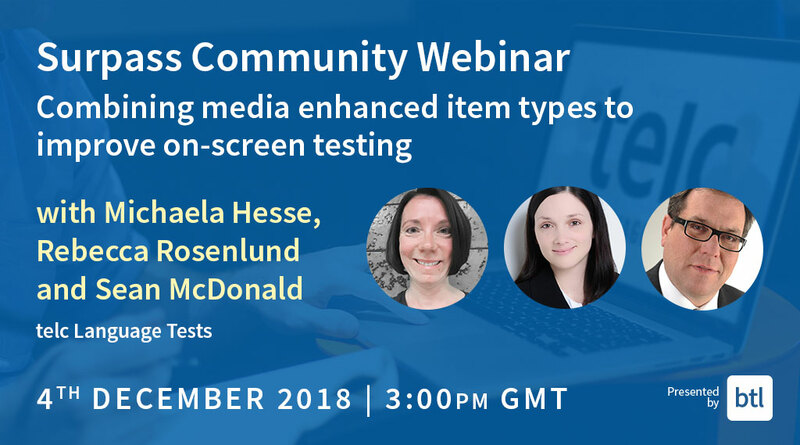 Join members of the BTL Test Centre team as we discuss how the network supports Assessment in the Surpass Community and how independent centres can join this global operation. Addressing questions commonly asked by potential users and the test centres themselves, this webinar will tell you everything you need to know as we broadcast live from an Independent Test Centre in Leeds, UK. The long established “Innovations in Testing” conference returns in 2018, and will be located in San Antonio, Texas. Join members of the BTL team as we take you through some of the exciting new features that will be available in the upcoming release of Surpass. Viewers can interact using the live question form. The long established “Assessment Tomorrow” series of events will continue in 2018 with ‘e-Assessment Question 2018’, bringing together a range of speakers and delegates to share opinions and case studies from the industry. 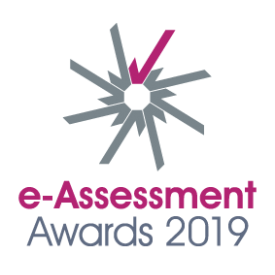 From their website: The e-Assessment Association is proud to be entering the second year of the International e-Assessment Awards. One of our key goals as an Association is to communicate the positive contributions that technology makes to all forms of assessment and we look forward to showcasing the very best practice, research and innovation taking place, from organizations, institutions and individuals working in this exciting field. Join us for a special case study webinar brought to you live from the offices of TWI. 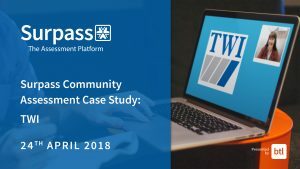 Hear how TWI have invested in summative assessment on an international scale and how they have used different devices such as Compute Sticks and Tablets to overcome test fraud. If you have missed previous release webinars, then feel free to watch on demand from our release archive. Join us ahead of the next Surpass release to see a live demonstration of the latest features. There is also a question form available for you to interact live with our presenters, getting the most out of this dynamic session. Join the BTL team as we discuss the role we can all play in providing accessible experiences for candidates in assessment. We’ll be joined by Leon Hampson, from BTL’s newly formed Accessibility team, who will be focusing on how new features in our HTML Test Driver can deliver assessments to WCAG 2.0 Level AA and Section 508 conformance levels. Register today to learn more about our recent achievements and what they will mean to the Surpass Community and its users. Join us to explore some of the excellent new features planned to be released to the Surpass Community. Viewers can ask questions as we demonstrate the latest features in Surpass. A recording of this webinar is now available to watch on demand from our release archive. Join like-minded industry professionals for a new breakfast seminar and networking event in the Chicago region. In this session, we welcome Manny Straehle from Assessment, Education & Research Experts (AERE) and Melissa Billings, National Board of Medical Examiners (NBME) to share their insights into advancements in Item Banking and Assessment. This is an industry focused event designed to provide assessment community professionals with an insight into the latest thinking in Item Banking and Assessments for certification, licensure, and training examinations. With guest speakers and industry networking, you’ll take away plenty of fresh ideas and connections to help you re-evaluate and grow your testing program. Manny is a consulting assessment, educational and research expert with a number of work experiences with licensure and certification organizations, and over 25 years of experience in the assessment industry. Over the past 15 years, Manny has taught various courses at the undergraduate and graduate level at Penn State University, Saint Joseph’s University, Johns Hopkins University, University of Southern California, and George Washington University. He is also founder and president of the Applied Life Learning Institute (ALL-I) where he offers free monthly webinars on education and assessment topics. He has published two books, several articles, and has presented at numerous conferences. Manny has also delivered presentations related to the value of credentials to help legislative aides in the US Congress to draft bills. Melissa Billings serves as Director of Test Materials Development at the National Board of Medical Examiners (NBME). She directs four editorial teams who develop licensing, in-training, and specialty/sub-specialty certification examination content for physicians, veterinarians and allied health professionals. She is currently Implementation Owner for NBME’s transition to Surpass for their contracted healthcare clients. Billings has been with the NBME since 2007, when she joined the Board as a Managing Editor. Melissa has worked in professional test development since 1997, previously working on regulatory licensing, certification, and K-12 educational content for several large testing organizations. We are delighted to welcome Manny Straehle and Melissa Billings as guest speakers at our September event in Chicago. Manny will be providing an insight into using technology for psychometrics, and Melissa will be discussing how NBME have been using Surpass to enhance their approach to item authoring and test development. Following the ‘ATP – Innovations in Testing’ conference in San Antonio, TX earlier this year, the E-ATP Conference in September brings together assessment industry professionals from around the world, with a focus on sharing best practice and success stories across borders. 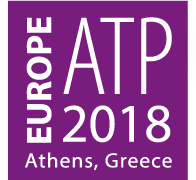 BTL are once again proud to support and exhibit at the event in partnership with our US team at BTL Surpass Inc..
We look forward to hearing your stories and case studies in Athens this September. 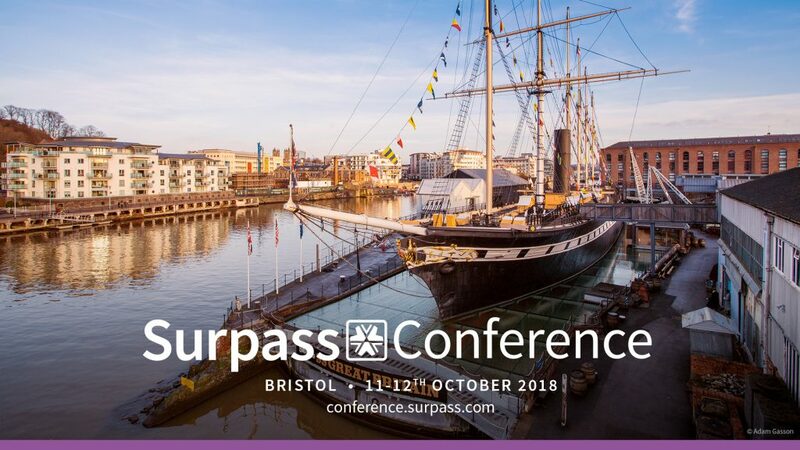 The annual gathering for the international Surpass Community will be held in Bristol aboard the SS Great Britain. Once again we’ll invite you to share your opinions on the product road-map and hear case studies from a range of organizations. If you have missed any of our webinars, you can watch on demand from our release archive. FAB is an excellent Awarding Organization industry event, covering policy, learning, assessment, and general innovation. At FAB you can network with like-minded individuals, form partnerships, and see what is on offer from suppliers such as BTL. BTL will be showcasing Surpass and running demonstrations of our flexible and advanced software. We strongly recommend attending this event if you are interested in the awarding sector in the UK. From their website: The ICE Exchange conference is the conference for the credentialing community. The name ICE Exchange reflects what is valued most by our annual conference attendees: the exchange of industry trends and best practice through live education and networking. The ICE Exchange touches on the many aspects of the credentialing ecosystem: Business of Certification; Certification Operations; Certification Technology; The Future of Certification; Governance; Marketing and Communication; Security, Records and Data Management; Strategy of Certification; and Test Development and Administration. 07th – 08th November 2018 | Washington, D.C. Beyond Multiple Choice is an exciting new event taking place in the U.S. with its foundations in the successful and long-established ‘Assessment Tomorrow’ series. Co-hosted with Perigean, speakers from the US, Canada and the UK will be igniting exciting conversations, including our own Tom Gomersall. Experienced Account Manager Emma Gilmartin will also be in attendance on behalf of BTL / BTL Surpass. Computer based assessment has grown significantly since the early days of automatic test publishing and certification. We have seen developments like paperless examination projects, e-proctoring, AI, the use of large scale assessments for recruitment and selection, credentialing and open badges, social media, ‘Bring Your Own Devices’, the growth of e-portfolios, the proliferation of question types, integration with e-Learning and back-office systems, the rise of government initiatives and policies around the world, the expectations and demands of digital natives and rapid changes in technology. This conference addresses just those issues bringing the latest tools and techniques into clear focus, evaluating how they can support learners and teachers in the modern digital age. Join like-minded industry professionals for a new breakfast seminar and networking event in the Washington DC region. In this session, we welcome Manny Straehle from Assessment, Education & Research Experts (AERE) and Jamie Saldutti, National Board of Medical Examiners (NBME) to share their insights into advancements in Item Banking and Assessment. Ibi is an assessment, psychometric and research expert with nearly 10 years of test development experience working with licensure and certification organizations. As Prometric’s Test Development Team Lead, Ibi oversees Surpass implementation projects and feature developments while leading a team of test developers to create high-performance content for Prometric client partners. She champions the use of best-practice methodologies in the creation of technology-based assessment tools for reliable, secure, and legally-defensible exams that properly validate candidate knowledge. Ibi holds a Master’s degree in Industrial and Organizational Psychology from the University of Baltimore. Jamie is an Infrastructure Director in the Professional Services division of the National Board of Medical Examiners (NBME). She has been with NBME for over 10 years in various project management and business process improvement roles, and has earned the Project Management Professional (PMP) and Certified Scrum Product Owner (CSPO) certifications. She has led the implementation of several 3rd party enterprise software solutions at NBME including Liferay Portal, Broadleaf eCommerce, and JReport for score reporting. Saldutti is a member of NBME’s Agile Steering Committee which is leading the adoption of Agile Scrum for the development of NBME’s proprietary applications. 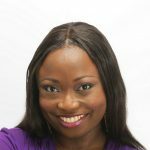 She is currently responsible for the project program at NBME that includes the implementation of Surpass to replace several NBME legacy systems used for authoring, editing and reviewing test items. We are delighted to welcome Manny Straehle and Jamie Saldutti as guest speakers at our September event in Washington DC. Manny will be providing an insight into using technology for psychometrics, and Jamie will be discussing how NBME have been using Surpass to enhance their approach to item authoring and test development. If you missed the fascinating training workshop with telc at the conference last week (or you simply can’t get enough of hearing from them), you’ll be glad to hear they will be co-hosting our next Surpass Community Webinar. Join us as we talk about their journey into e-assessment so far, and how moving from paper to on-screen has allowed them to truly innovate. As with all of our live webinars, we invite you to ask questions and interact using the question function on the Surpass Live web page. If you have missed any of our previous live streams watch on demand from our release archive. This Surpass special interest group is open to Surpass customers and those by invitation only, places are limited to ensure the day is a productive as possible. This event will take the form of a workshop exploring the topic of EPAs and the opportunities and challenges is presents to BTL’s customers. Feature requirements to stay ahead of the competition. Once again BTL are looking forward to this fantastic event and the insight it brings to the global testing sector. This year we are also proud to announce that BTL will be exhibiting at the event as a Gold sponsor, and presenting an ePoster session. From their website: The 2017 Innovations in Testing Conference brings together assessment industry professionals from practice areas such as Certification/Licensure, Clinical, Educational, Industrial/Organizational and Workforce Skills Credentialing. The conference provides a venue for attendees to learn from and collaborate. Plan to attend as we showcase innovation, explore best practices and present case studies – all in an effort to move our industry, and professionals like you – forward. The long established “Assessment Tomorrow” series of events will continue in 2017 with e-Assessment Question 2017, bringing together a range of speakers and delegates to share opinions and case studies from the industry. This year also sees the conference working together with the e-Assessment Association to produce the first e-Assessment Awards Gala Dinner. The 2017 AO Forum continues to be presented in association with the Federation of Awarding Bodies, and once again BTL are proud to be exhibiting at the event. More details about speakers and represented organisations can be expected on the official event website soon. End-Point Assessments have been introduced to enhance the quality and validity of apprenticeship training. With knowledge-based testing being a fundamental part of that process, it is important that AAOs have access to professional assessment tools. Surpass is already used by a large number of AAOs for existing non-apprenticeship training, therefore making it the perfect choice for EPAs when delivering high-stakes knowledge-based assessment. 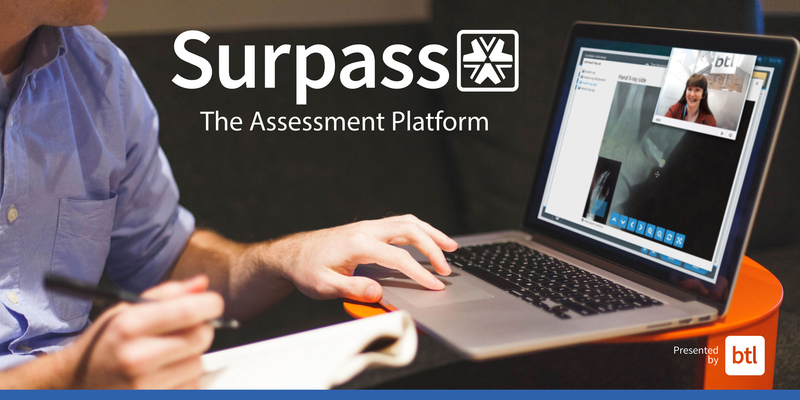 Surpass supports the creation and delivery of complex assessments with rich and engaging content, perfect for AAOs wishing to provide realistic assessments either as part of a scenario or with example industry documentation and reference material. During this EPA webinar, we will take you through the features within Surpass that let you build and share rich, professional assessment content. 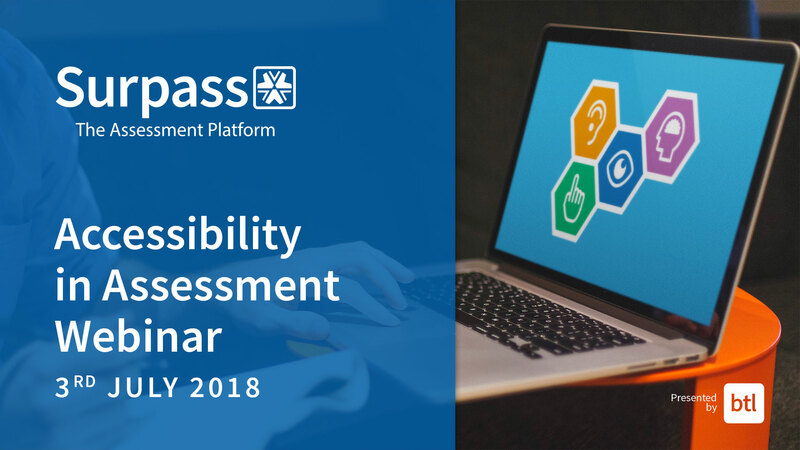 Join us for this, the first in a mini-series of webinars, looking at Surpass and its support for customers undertaking or planning on undertaking End-Point Assessment work. The Assessment Tomorrow series of conferences continues with its popular one day event focussed on the latest use of technology in vocational assessment and the impact it has on all involved. Taking into account the changing needs of existing users, and making use of well-researched User Interface design techniques, the next release of Surpass BTL will introduce a cleaner and more manageable authoring experience. These changes are an evolution – further streamlining the item creation process and making it more intuitive for item authors. To give you an insight into the new interface, we will be hosting a webinar introducing the new interface – giving you the opportunity to ask your questions and understand the thinking behind the new layout. Sign up to join us for this exclusive look at the upcoming changes to Surpass: The Assessment Platform. A recording of this webinar will be made available after the event. An introduction to the new interface. The rationale behind the changes. Future planned development in this area. An insight into other features planned for the next release. Developing using the Agile methodology ‘Scrum’ is something BTL decided to commit to over 3 years ago. It has been a big culture change, not only for BTL, but for the high-profile members of the Surpass Community. Surpass: The Assessment Platform is an integral part of the businesses it is used by, and development needs to be rapid and of the highest quality; BTL’s commitment to Agile and Scrum has enabled this. Join us for what will be a fascinating exploration of how Agile has enabled the Surpass Community to shine in the world of assessment. 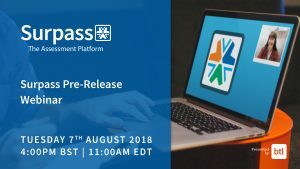 Join members of the BTL team as we take you through some of the exciting new features that will be available in the upcoming release of Surpass. Viewers can interact using the live question form, and this is the perfect opportunity to see the latest features before attending the Surpass Conference the following week. More details on attendees from BTL are available now on http://www.btl.com/eatp along with our ‘book a demo’ form. 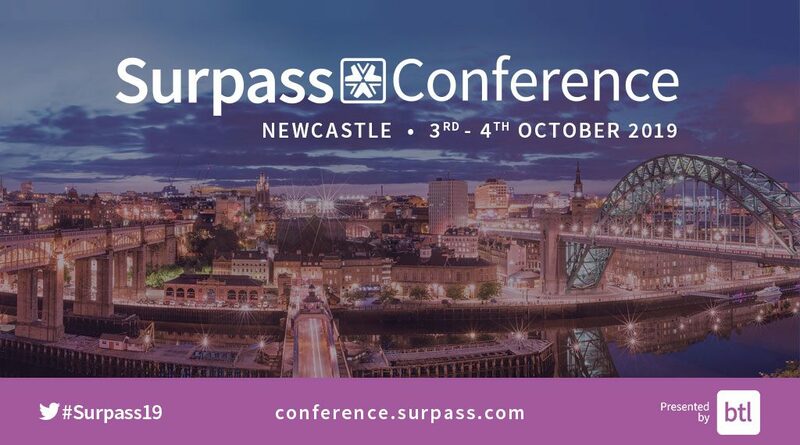 Celebrating the 10th Anniversary of Surpass: The Assessment Platform, this year we are inviting you to join us in York. Presentations and videos from previous Surpass Conferences are now available on conference.surpass.com. More details about the 2017 FAB Conference, Awards and Exhibition will be made available shortly. One of the many innovations recently added to Surpass is the use of linear optimisation to aid in the automation of test assembly. This powerful development can assist your organization and its psychometricians to create the best possible test forms in a fraction of the usual time. In this webinar, Tim Burnett will be joined by BTL’s Senior Solutions Architect Dave Dixon to explain in a little more detail how linear optimisation already benefits the wider testing industry, and how the new features in Surpass can unlock opportunities for your organization. Dave will also be discussing the new Linear On-the-Fly Testing (LOFT) functionality which has been introduced in the latest update to Surpass. Join us for a special year-end webinar where we look back at 2017 and what has happened in the assessment industry. This webinar will include highlights from the 2017 Surpass Conference.